Many Americans cite leading a stress-free life and having “peace of mind” as their personal definition of wealth. That doesn’t sound too money-centric on the face of it—until you consider that money, or specifically the lack of it, is a major source of stress. Americans don’t like to admit that assets can buy happiness—just 11 percent of those surveyed for the second annual Modern Wealth Index from Charles Schwab chose “having lots of money” as their definition of wealth. But while most respondents selected more high-minded concepts as their keys to contentment, they weren’t afraid to put a number on what they needed to get there. 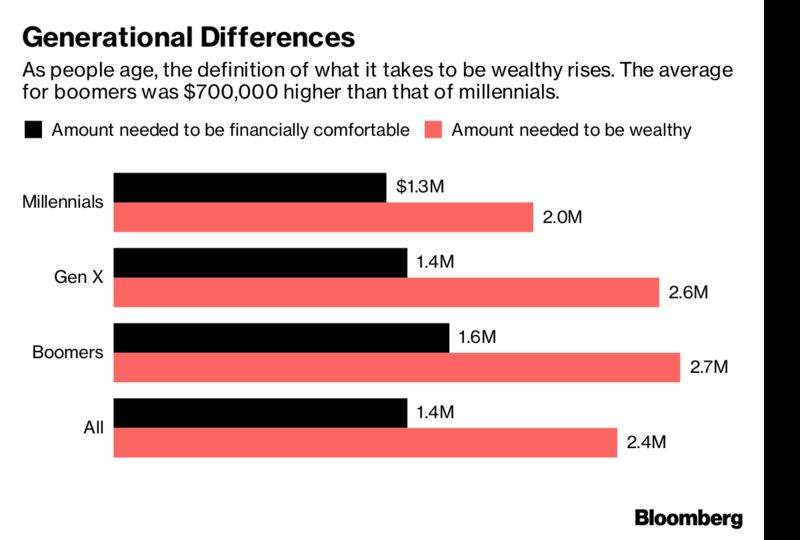 To be financially comfortable in America today requires an average of $1.4 million, up from $1.2 million a year ago, according to the survey. The net worth needed to be “wealthy”? That’s an average $2.4 million, the same as last year in the online survey of 1,000 Americans between age 21 and 75. The survey asked people to choose which of the below statements came closest to their personal definition of wealth. When asked about what made respondents feel “wealthy” in their daily lives, the survey found that spending time with family was most commonly cited, at 62 percent overall. That was followed by what can be the most elusive of things, cited at about the same level across generations: “taking time for myself,” which came in at 55 percent. Hard to do either of those without some bank, though.